Cute as a button! This home’s multi-peaked roof line and sheltered entrance create a warm and friendly welcome for guests, and hint at the cozy, family friendly atmosphere just inside the door! A wonderfully large and informal living/family room spans one side of the first floor and is open to an informal dining or breakfast area and a spacious well-equipped kitchen. A separate laundry room, a handy powder room and a convenient two-car garage complete the first floor…truly a place for relaxing togetherness with family and friends. Both three and four bedroom versions of the upstairs are available. Either choice provides spacious bathrooms, a walk-in closet for the owner’s suite and ample closet space in the other bedrooms as well. As it is with every J.A. 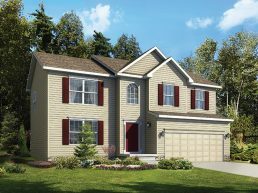 Myers home, the Aubrey offers hundreds of decorative choices for YOU to make, resulting in a home that’s truly YOURS!